NYC Families – Lots of Pre-K Spots Are Opening Up – Apply Now – April 23 Deadline! Attention Parents of NYC Preschool students: 21,440 new spots will open up for Fall, 2014 now that De Blasio got $300 million in funding for free kindergarten Classes in NYC. 20,000 more seats will open up in 2015. Here is the note I received about it. Be sure to check out those links if you are looking for pre-K in the City! We are happy to announce that new full-day, public school pre-kindergarten (pre-k) programs will be available this September! For a list of these new full-day options, please see our Pre-K Expansion Guide, which is available on the pre-k website or at an Enrollment Office next week. The deadline to submit your public school pre-k application is Wednesday, April 23. If you already submitted an application and want to apply for one of these new programs, you can update your program choices through your online application account or by submitting a new paper application at an Enrollment Office. If you have any questions, please contact ES_Enrollment@schools.nyc.gov or visit our pre-k website. You can also find translated versions of Pre-K Admissions resources on the following pages: Arabic, Bengali, Chinese, French, Haitian Creole, Korean, Russian, Spanish, Urdu. We look forward to supporting you through this exciting process! Amy Zimmer did an excellent job capturing the latest when it comes to testing and test prep for NYC private schools for the 2014-2015 school year. Things are still very much in the air. Look for more schools to announce what they will be doing in the coming weeks and months. As Amy said, there will be more informal testing done during school visits than before, plus many parents will go ahead and have their child take the ERB even though many schools will say that it is optional. To read this article at the DNAinfo website, CLICK HERE. MANHATTAN — A high-stakes admissions test for private school will no longer be required across the board as it has been for decades — but that won’t stop families signing up to take it, parents and education experts said. The Independent Schools Admissions Association of Greater New York — a coalition that counts nearly 140 of the area’s private schools as members — recently told schools that they could decide whether to continue requiring applicants to take the ERB, as it’s commonly called. The relaxation of the demand is based on concerns that youngsters were over-preparing for the $568 exam, school insiders said. But since some schools have chosen to keep the ERB as a requirement for kindergarten admission and others are making it optional, parents are still feeling pressure to prepare their kids and sign them up for the test, experts said. Families tend to apply to 12 schools on average since admissions rates are so low, and odds are good that at least one of those schools will require the ERB. Even families that only apply to schools where the ERB is optional will likely still take the test, she said, to prevent the schools from assuming the child did poorly on the test and that’s why no score was submitted. Some schools have begun announcing their decisions on the ERB, and more are expected to do so soon as they gear up for April school tours and as ERB testing begins for students starting kindergarten in the fall of 2015. The test evaluates kids on verbal and non-verbal skills, including vocabulary and identifying patterns, in a one-to-one setting over 40 to 50 minutes. One school that will continue requiring the ERB is the elite Riverdale school Horace Mann. At Downtown’s Léman Manhattan Preparatory School, the ERB will be optional starting this year, said Drew Alexander, the head of school. “Now the interview piece is going to be more probing,” Goldman said of the schools that are no longer requiring the ERB. She is concerned that “a consistently inconsistent” process would be even more stressful on 4-year-olds who will likely be subjected to longer in-school evaluations in place of the ERB. Karen Quinn, best-selling author of “Testing for Kindergarten” and co-founder of online test prep service TestingMom.com, worried that families will feel burdened by the options. “If [parents] are applying to schools that still want the ERB, many parents will feel they need to prepare their kids for the ERB and for some kind of unknown testing — which is more prep than they had to do in the past,” she said. An Upper East Side mother of a 4-year-old boy, who plans to apply to the UN International School and the World Class Learning Academy and who asked not to be named, said she was still prepping her son for the ERB and recently bought TestingMom’s $297 IQ Fun Park. Recently, ISAAGNY met and decided that NYC’s private schools can each use their own approach to assessing young children’s abilities in their admissions process. It looks like some schools will continue to use the ERB, while others may choose a different test or approach to measuring a child’s skills. In fact, this is how private schools in L.A. assess students. When kids come in for their school visit, they are taken aside for part of the time and administered a “test.” Parents don’t know what the test is. Each school does its own thing. It allows the schools to evaluate students based on whatever criteria is important to that school. For NYC parents, the big question now is, “what do I do?” In the past, you could do a bit of prepping so that children would know what to expect on the ERB, and that would be it. There was only one test to get ready for. Now, depending on the number of schools you are applying to, some may ask for the ERB while others may do their own test (and you won’t know what it is). Here is the good news. There are only so many things that a 4 – 5 year old is expected to know and understand and be able to do. In my book, Testing For Kindergarten, I call these the “7-Abilities” Students need for testing and school success. They are: Language, Information/Comprehension, Thinking, Memory, Fine-Motor, Mathematics, and Visual-Spatial Reasoning. As long as your child is really solid when it comes to these abilities, he or she should do fine on any kindergarten admissions test they have to take. At www.TestingMom.com, we have an entire kindergarten readiness section that takes you through each of these abilities, practice questions from all kinds of different tests that assess these skills, and ideas for parents on how to build these skills with their children through fun activities and games you can do at home. Take a look and get started in making sure that your child is “solid” when it comes to any of the skills and abilities that private schools will be testing for now that the ERB is no longer a requirement in NYC. Here is Sophia Hollander’s article on what is happening with ERB from the Wall Street Journal. To read the article there, CLICK HERE. A coalition including some of New York City’s most prestigious private schools captured the attention of parents and educators last fall when it announced a search for an alternative to its longstanding admissions test. Now, the answer appears to be in, and it won’t fit neatly into a test sheet’s bubble: There is no single solution. For the first time in nearly half a century, there likely will be no universal standardized test used by the majority of the city’s independent schools, education officials said. Instead, each school has been asked to devise its own admissions plan, which may include new exams, strategies and targeted games—or even sticking with the old test, which has been administered in some form since 1966. Officials at the Independent Schools Admissions Association of Greater New York announced the decision at a meeting of school leaders on Wednesday, according to people at the meeting. Association officials didn’t respond to calls and emails requesting comment. For years, kindergarten applicants to many private schools—most of them 4 years old—have had to go through a fiercely competitive process: take the Early Childhood Admissions Assessment, commonly known as the ERB; go through an interview with school officials; and participate in a play group. Now, families—who are advised to apply to multiple schools—will have to navigate a more fragmented admissions process, officials said. The decision ended a five-month study of alternatives to the ERB, a version of the Wechsler Preschool and Primary Scale of Intelligence. The rise of test-prep companies undermined its validity, some school officials said. Some also worried about the expense ($568 this year). Still, 3,173 applicants took the test in 2012-13. Some private school administrators praised the schools association for empowering schools to shape their own admissions processes. Others questioned whether the change would create more stress for families. “I’m disappointed because I would have liked more central direction,” said George Davison, head of Grace Church School in Greenwich Village, cautioning that the changes could “drag out the process” for parents. Officials at the Educational Records Bureau, which administers the test, criticized the decision. It “will create significant new burden on schools, parents and children,” said Anne Sullivan, vice president of member services, in an email. She said many schools were interested in continuing using the test. “We’re reviewing the recommendations, and we’ll make a decision about the tools that we’ll use—including the ERB—in the coming weeks,” said Kevin Ramsey, the communications director for Trinity School on the Upper West Side. The association’s decision to not replace the ERB reflects a growing unease among educators regarding the role of standardized tests for admissions. Earlier this week, the College Board announced an overhaul of its signature test, the SAT, in an effort to improve its fairness and reliability. 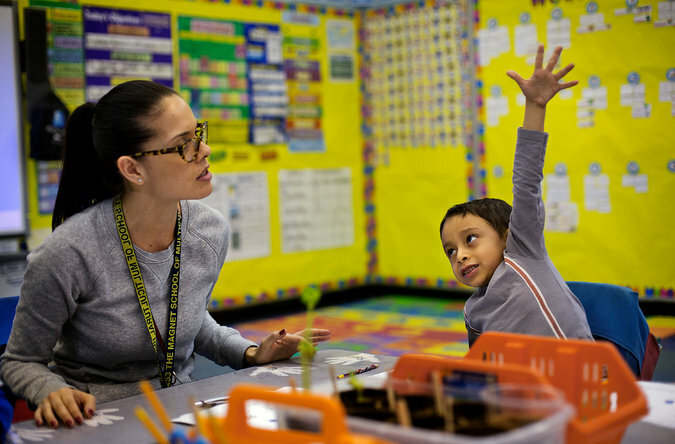 Last year, New York City revamped the admission tests used for its gifted and talented program, which also covers kindergarten admissions. At the meeting this week, private school administrators were presented with a range of admissions strategies and games designed to evaluate abilities, including one test administered via iPad, according to multiple meeting participants. They also proposed a series of workshops to learn more about different approaches. Some schools praised the varied approach. “I think ISAAGNY did a fabulous job in offering all these different ways that we can measure children,” said Teri Hassid, head of the lower school at Friends Seminary, which had already stopped using the ERB. One game presented at the meeting involved telling a story with three animals or objects as characters, Ms. Hassid said. Midway through, the teacher asks the child to add an additional element, like a toy or a boat. “That measures flexible cognitive thinking,” Ms. Hassid said. Families may still have to take the ERB, said Suzanne Rheault, CEO of Aristotle Circle, a tutoring and educational consulting company. Some schools, including Horace Mann, have declared their intention to continue requiring the test. Others may make it optional—which families may interpret as mandatory for the most competitive schools. “I think it’s just a shame to go through all this hassle, create all this uncertainty and at the end of the day what parents are probably going to have to do is continue to take the ERB” while preparing for additional exams, said Ms. Rheault. Edwin Mullon has two children, now 11 and 10, currently enrolled in private school. The admissions process was a struggle, but he and his wife took solace in knowing that there was a one consistent standard, he said. Parents now might worry about subjective criteria like “who do you know” creeping into the process, Mr. Mullon said. I wanted to share the excellent article on the status of common core in NY and other states. The implementation of this new curriculum has been far from smooth. Everyday there seems to be news of a state dropping out of testing consortiums they have initially gone with, parents and teachers protesting the new standards, states pulling back on their commitment to the new standards and more. It’s such a changing landscape, it’s almost impossible to keep up with. If you’d like to read this article at the NY Times website, CLICK HERE. I recommend that you take a look because it does a great job summarizing what has been taking place with these new standards across the country. If you are not sure about the latest with common core in your own state, just google “Common Core in [state name]” and the most recent news about the standards in your state will come up. I know that many parents are against the new standards because they are harder and have been implemented in such a clumsy way in most places. I’ve been working with them to create practice questions for my other site, www.TestingMom.com. And yes, they are much harder. At the same time, I feel that once teachers begin to create and teach lessons to support the learning of these standards, kids will be better off in the end. The standards really emphasize thinking and analysis, which is so critical to success in school and life. They probably should have introduced these standards over a longer period of time, and not tested for them until the children had been taught a curriculum based on the standards for a year or two. Unfortunately, that isn’t what happened and now everyone has a bad taste in their mouths about common core. Still, it seems like it is here to stay. So it is important to understand what it is and how it will impact your child. Have you bought electronic gifts for your 3-year-old this holiday season? I wonder if it is something I would have done for my kids if such items were available when they were toddlers. I can certainly see the attraction. If you do succumb to the temptations, I think it’s a great idea to “neutralize” the gift with an easy bake oven or tickle-me-Elmo! This article appeared in today’s NY Times. CLICK HERE to read the piece at the Times website. “Smarter Giving With Apps!” shouted the December cover of Manhattan Family, a monthly publication geared to families with young children. The article, written by a kindergarten teacher, noted that “traditional gifts, like clothes and toys” can be costly “and not always what children are wishing for.” Apps, on the other hand, she wrote, are cost-effective, educational and fun – the perfect gift. It is a confounding situation for toymakers, which, according to the Toy Industry Association and statistics compiled by NPD Group, have barely managed to eke out any gains in the past few years. Contributing to the doldrums is the fact that there is no super-hot, must-have toy this holiday season — no 2013 equivalent of the Cabbage Patch doll or the Tickle Me Elmo or even the Zhu Zhu Pet. On a recent snowy morning, the first thing holiday shoppers saw after entering the Toys ‘R’ Us flagship store in Times Square (after being welcomed by a man in a giraffe costume) was a sign advertising the iPad. Indeed, nostalgia can be a powerful tool for retailers. Part of that is brand recognition, because just like finding a familiar box of Cheerios in the grocery store, Barbie and G.I. Joe need no introduction. But there is also something more emotional at play. A friend sent me this article from GothamSchools.org. This piece does a great job explaining the difference between old and new state achievement test math questions (old achievement test vs. common core aligned test). It also talks about how teaching will have to change going forward to prepare students for these tougher yearly assessments. Even if your children are young and won’t be taking these new achievement tests for many years, it is important to look ahead and know the level of expectations that are coming for your child. It won’t be easy. You can’t depend on your child’s teachers to do it all. You will need to pay close attention to be sure your child is mastering the common core standards for each school year. No one will do a better job of this than you. If you would like to read this article at GothamSchools, CLICK HERE. When I first saw the Common Core math standards, I wasn’t sure precisely what made them more rigorous than the old ones. It wasn’t until New York State released sample Common Core-aligned questions, and I started working with teachers to adjust their classes accordingly, that I began to understand what sets the new standards apart and how we can prepare students to meet them. When New York State adopted the Common Core in 2010, I was working as a math coach in the Fayetteville-Manlius School District in the Syracuse area. (I recently left to become a science, technology, engineering, and math coordinator for Skaneateles Central School District). I worked with many teachers to figure out what the new standards asked of students and how classroom instruction should shift as a result. This article comes out of conversations I had with math teachers and especially with Caryl Loranidini, an eighth-grade teacher in Long Island, as we worked together to figure out what the new standards asked of students and how classroom instruction should shift as a result. Shifting our instruction to reflect the Common Core was tough those first two years, since we didn’t have many examples of what Common Core-aligned questions actually looked like. Our first break came in June 2012, when New York State released sample questions for grades 3-8. Our initial reaction to these questions was, “Wow. You’ve got to be kidding! These are really hard.” We noticed problems we were used to seeing in one grade moved down one or more grade levels, which meant students would have to master material sooner. But as we dug deeper, we were able to name and describe some of the things that made the substance of the new questions, not just their placement, different from the old ones. This understanding helped us develop practice questions that would familiarize students with the problem-solving skills they needed for the new tests. strong distractors in the multiple-choice questions. The questions below illustrate some of the differeces we identified between the old and new standards. In each pair, one question is aligned to the old standards and one is aligned the Common Core. 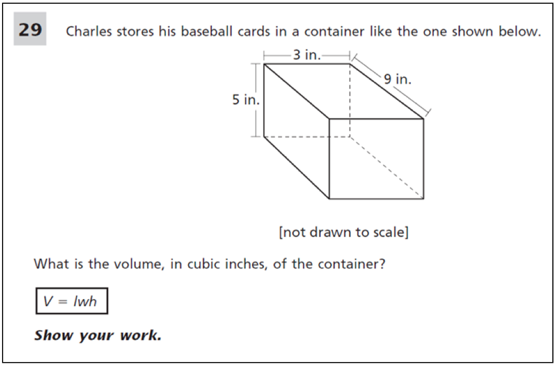 In this first pair, while the questions test the same content, the Common Core-aligned question requires students to complete multiple steps in order to solve for a missing part. Instead of simply adding two numbers, as students can do to answer the first question, to answer the second question they need to add up the miles driven on Friday and Saturday and subtract that number from the total amount driven. 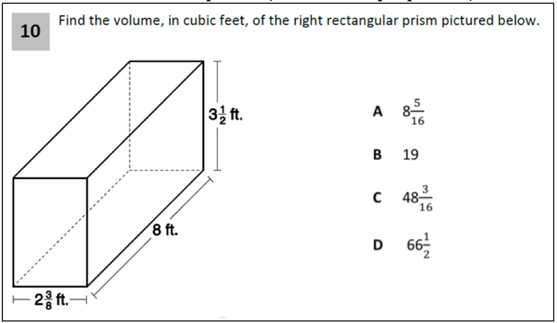 The old 3-8 tests asked questions that could always be solved by doing one simple calculation. If two steps were needed, the questions would be split into two parts and it would tell you to solve step one, then step two. This did not prepare students for the demands of higher level math classes in high school or college; nor did it prepare them for the real world. If your boss had to give you step-by-step prompts to solve every problem, you would have a short career. The new Common Core question also removed the formula from the question itself, instead locating it on a “reference sheet” provided at the beginning of the book. The effect of this edit is that students now have to “use appropriate tools strategically,” a practice required in the new standards. The questions above illustrate how the standards are being tested in less predictable ways, which was scary for me as a math coach, and for the teachers I work with. We realized that teachers could no longer prepare students for the state tests by simply exposing them to all of the kinds of questions that had been used in the past. We would have to teach students skills and procedures so that they can do them, they understand them, and they can apply them to solve unfamiliar problems. We couldn’t have come up with these problems without carefully studying the sample test questions released in June 2012 and about a dozen questions released for each grade level of the tests administered in May 2013. Once we figured out what it meant for standards to be more rigorous, and what a more rigorous question looked like, we found ways to tweak existing questions to increase their rigor. We hope that as we get better at writing and asking these sorts of questions, our students will get better at making sense of them and persevering in solving them. It is so disturbing to read this piece about fewer teachers and larger classes due to budgetary constraints. We’ve just introduced Common Core standards into schools in (about) 45 states. I don’t know how teachers can be expected to integrate these new, harder standards into their curriculums while managing bigger classes full of students with so many different needs. It is an untenable situation. More than ever, parents are going to need to step in and support their children’s educational development. You cannot outsource your child’s education in these economic times. To read this piece at the NY Times’ website, CLICK HERE. In Pennsylvania, although the state’s education budget is now above prerecession levels, a large proportion of money is being diverted to replenish underfunded pensions, leaving less for actual classrooms, said Michael Wood, research director at the Pennsylvania Budget and Policy Center. 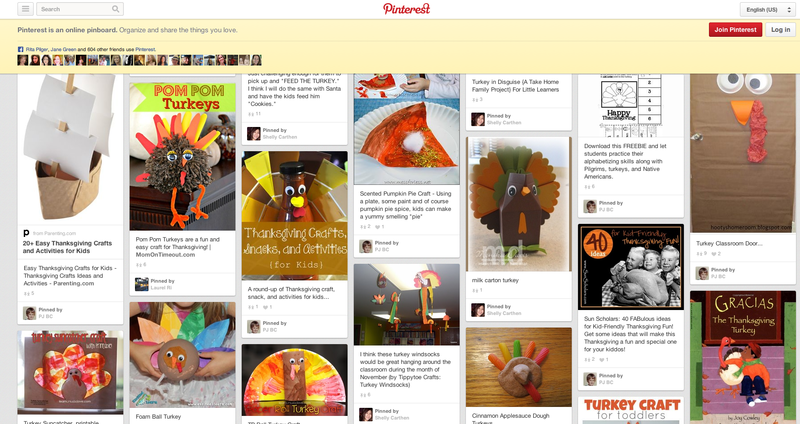 If you are looking for some fun, learning projects to do with your preschooler or kindergarten age child this Thanksgiving, CLICK HERE for the best Pinterest page full of Thanksgiving projects. It is bursting with ideas that will keep you busy all weekend. If only we’d had Pinterest when my kids were little! What a wonderful resource for learning activities you can do with your kids. Changes for NYC Gifted and Talented Admissions – The 2013-14 Handbook is Out! The NYC DOE released their 2013 – 2014 G&T Handbooks today! You can visit the page and find your handbook by CLICKING HERE. The handbooks are listed below the big pink boxes. The biggest change in G&T Admissions for next year is that the two tests that students take – the OLSAT and the NNAT2 – will be given equal weight this year. Last year, the OLSAT counted for 35% and the NNAT2 was worth 65%. This year, it will be 50%-50%. I will be there speaking, so I hope to see you there! I wanted to share this wonderful infographic that was sent to me by Cara Delany today! Thanks, Cara.